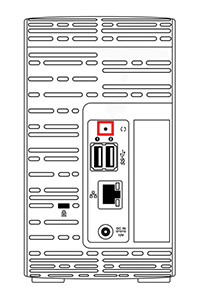 There are two options to Reset a My Cloud Mirror device, both use the Reset button located on the back of the device (see illustration for exact location). Please see details and instructions below. The 4 Second Reset will only reset the Admin Password. It will not reset the Admin User Name. In order to reset the Admin User Name perform Option B - the 40 Second Reset outlined below. With the power on, using a paperclip or narrow tipped pen, press and hold the reset button for at least 4 seconds. The reset process will cause the device to reboot and may take up to 5 minutes to complete. Please wait until the Power LED is solid blue, indicating the device is ready to use. This process may take upwards of 15 minutes. Please wait until the Power LED is solid blue, indicating the device is ready to use.